Controlling rhino poaching with the country’s eyes on you is just one of the many tasks that fall under managing the massive area that is the Kruger National Park (KNP). With nearly 2-million hectares of diverse flora and fauna to keep track of, and only about 300 field rangers to do so, monitoring the park is a logistical nightmare. However, the use of innovative technology and customised open-source software is making the ongoing conservation of South Africa’s natural heritage possible. The Kruger National Park is divided into 22 sections, each managed by one section ranger with a number of field rangers to patrol each section every day. Field rangers are imperative for conservation – from the ground, they contribute directly to the management of the park by collecting basic environmental data during their daily patrols. Information such as the distribution of rare and endangered species, availability of surface water and disease outbreaks are integral in the ongoing management of the park. These indicators are used by the SANParks management to provide an early warning system for disease outbreaks, identify trends in illegal exit and entry points, and enable the detection and control of invasive alien species. Therefore, it is extremely important that the data collected is accurate, but when information is recorded manually it is almost impossible to ensure its complete accuracy, which makes collating and using the raw data for decision-making difficult. When faced with the unique set of challenges that the Kruger National Park presents in terms of ecological conservation, Douw Swanepoel, a Section Ranger of the Kruger National Park, recognised the value of the CyberTracker system in 2000 and soon afterwards 44 GPS devices were purchased for the park. CyberTracker is an open-sourced programme developed by Louis Liebenberg who felt that there was a need for a tracking programme that could work from a palmtop device. The programme is freely available, and the Kruger National Park team has customised the programme specifically for the park’s needs with databases including ranger patrols, vegetation condition assessments, animal behaviour monitoring and invasive species distribution mapping. The CyberTracker programme used on the Trimble device form a solid partnership, producing a piece of equipment designed specifically to assist with conservation in the park. With an icon-based interface and descriptions in both English and local language, the CyberTracker system is easily accessible to field rangers regardless of literacy. Information is recorded with latitude and longitude coordinates through the integrated GPS system, ensuring that separate GPS skills are not necessary, and as data is captured electronically using graphic check lists, inaccuracy is reduced and minimal training is needed before the rangers can begin recording data. Moving map functionality allows the ranger to pinpoint his exact location on a 1:50 000 or 1:250 000 topographical map or aerial photograph should a ranger urgently need assistance from the SANParks office. With a built-in camera, rangers can document and geotag exactly what they see and send the photo immediately from the field to the office for review, increasing field to office collaboration. The devices are useful as part of a long-term solution because at the end of each day, the data that the field ranger has collected is downloaded on to the section ranger’s computer and then uploaded to SANParks’ GIS/RS Analyst, Sandra Mac Fayden. This allows her to create a full, sophisticated picture of the environmental state of the Kruger National Park with intricate detailing that can only be sourced by professional field rangers with a working knowledge of the area. Once the data has been downloaded it is archived and documented so that it is usable in the long-term. Thresholds in the programme are set so that the limits of acceptable change in the environment can be monitored. The data in the database is then used in routine analyses run through the programme in order to assess whether there is any danger of ecological factors exceeding those thresholds, thereby warning park management of any unacceptable changes. For example, monitoring data is analysed for each river which flows through the Kruger National Park and should water levels lower and exceed the threshold set by park management, urgent action is required. With something as volatile and ever-changing as ecology, correct data is essential in its efficient management. In the fight against rhino poaching in the Kruger National Park where intervention and constant vigilance is necessary, rapid decision making is critical and this is only possible when every step of the data collection and analysis is accurate. 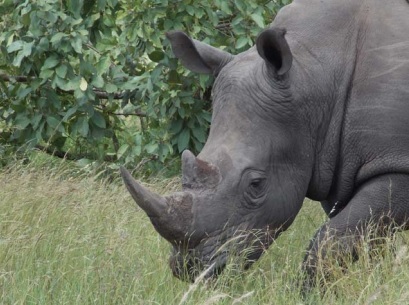 By using the irreplaceable knowledge and ability of field rangers, curbing human error through easy-to-use software and technology with GPS capabilities, the SANParks team is efficiently managing the vast and diverse ecosystem of the Kruger National Park and engaging in the ongoing fight against rhino poaching. This entry was posted in 2 CyberTracker Software, 4 The Art of Tracking, 6 Conservation and tagged anti-poaching, CyberTracker, Kruger National Park, Rhino poaching, SANParks on 2014/02/11 by Louis Liebenberg.